Is the name of the championship team really the Hickory High Huskers? No. 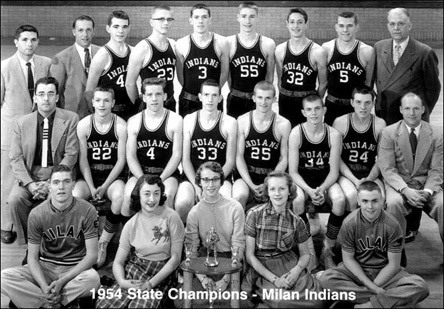 The championship team on which the Hoosiers true story is based is actually the Milan High School Indians. There is no town of Hickory in Indiana. Was the Coach really a middle-aged man? played by Gene Hackman who was 55 when the movie was being filmed. Screenwriter Angelo Pizzo said the following about keeping the Coach in the movie the same age as his real life counterpart, "I wrote it that way and the movie didn't work. If he had failed, he still had the rest of his life. I went back and made the character older, a guy with a last chance." At the time of the actual championship, Coach Marvin Wood had been a recent graduate of Butler University, where he played both baseball and basketball. At Butler, Marvin played on two Hoosier Classic championship teams (1947-48 and 1948-49) when Butler defeated both Indiana and Purdue in the same tournament. Was the Coach really hired to replace a former Coach who had died? No. In the film, Coach Norman Dale is hired to replace a well-liked Coach who dies. The team's star player, Jimmy Chitwood, refuses to play for part of the season because he's so upset. In real life, Coach Marvin Wood was hired the previous season to replace Coach Herman "Snort" Grinstead, who was fired for ordering new uniforms against the superintendent's orders. In an ESPN interview, Bobby Plump (the real Jimmy Chitwood) said that Coach Grinstead was "the most popular coach in Milan's history." Was it really the Coach's first season with the team? No. As stated above, it was Coach Wood's second season with the Milan Indians. He actually took them to the semi-finals the previous year. During his second year, which is what the film depicts, the town was no longer skeptical of his new strategies for offense and defense. The town was behind him. This is opposite to what is shown in the movie, where a community referendum is held to determine the Coach's fate. Did the team's star player really sit out half the season, upset over the previous coach's death? No. The Milan Indians star basketball player, Bobby Plump, played the entire season. Although the former Coach was well liked, he did not sulk over the firing (not death) of the previous coach, Herman "Snort" Grinstead. Did a romance really develop between the Coach and a teacher? No. In the movie Hoosiers, a budding romance forms between Coach Norman Dale (Gene Hackman) and teacher Myra Fleener (Barbara Hershey). In real life, Coach Marvin Wood was married with two children (pictured left). He was not romantically involved with a teacher from the school. Coach Wood's wife, Mary Lou, often worried aloud, "If a basketball and I were placed at half-court, which one would he choose?" Rick Paridaen, a friend of the family, believes the answer would easily have been Mary Lou, the real love of Marvin's life. The film's romance was an element of fiction added by screenwriter Angelo Pizzo, whose other work includes the script for the 1993 football drama Rudy, also based on a true story. Was Dennis Hopper's character based on a real life assistant coach? No. Dennis Hopper's character of "Shooter", who is the town drunk and father to one of the players, is entirely fictional. It is a little ironic (or maybe not so ironic) that this fiction-based performance resulted in an Oscar nomination for Hopper, which was the only acting nomination that the film received (Hoosiers was also nominated for Best Original Score). In real life, Marc Combs and Clarence Kelly were the assistant coaches. Neither of them were drunks. Did the real Coach wear a shirt and tie to practice? No. In the movie, Gene Hackman's Coach Dale is a hardliner who runs his drills in a shirt and tie. Coach Marvin Wood was much more soft-spoken and often suited up and played with the team during practices. Had the real life Coach been previously fired from coaching for punching one of his players? No. The somewhat volatile Coach Dale in the movie had been fired from coaching on the collegiate level for punching one of his players. In real life, Coach Marvin Wood had never been fired for punching a player. Screenwriter Angelo Pizzo based Gene Hackman's outspoken Coach Dale partially on Indiana University's legendary coach, Bobby Knight. "I wondered what would happen if Knight punched a player," says Pizzo. Many who knew the real Coach have stated that Coach Marvin Wood was much more soft-spoken than his onscreen counterpart. Coach Wood often said of his championship squad, "God was coaching that team, not me." Was the real school so small that it could only field six players for the team? Not entirely. Similar to the fictional Hickory High in the film, it's true that there were only 161 students enrolled at the real school (Milan High). However, unlike in the movie, 58 of the 73 boys at the school tried out for the basketball team. There were 10 players on the Milan team in 1954, not six. Did the real-life Coach practice the philosophy of four passes before a shot? No. Hoosiers screenwriter Angelo Pizzo based this fictional element on Indiana University's coach, Bobby Knight. "I utilized Knight's offensive philosophy: four passes before a shot," says Pizzo. Did the team's manager really hit two free throws to win a game in the semi-finals? No. The movie shows the team's manager, "Ollie," coming on to the court to hit two free throws to win a semi-final game. Milan's manager, Oliver Jones, stayed on the sidelines and never shot any game winning baskets. The only real similarity with the movie's character is the name. Did Milan really win every game in the tournament with a final second shot? No. In the movie, Hickory barely squeaks by its opponents in the state tournament, winning each game with a last second shot. In real life, Milan won seven of its first eight tournament games by double-digit margins. 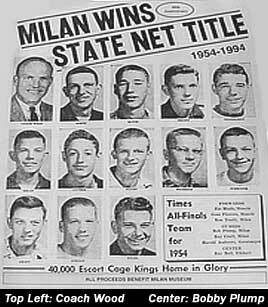 Milan's 1954 tournament record is posted below. They were 19-2 in the regular season. In real life, did the Coach really measure the height of the hoop where the state finals were going to be played? Yes. Coach Marvin Wood measured the height of the hoop at Butler University's enormous Hinkle Field House, where the 1954 state finals were played (and where Wood himself played in college). Coach Wood did this to "cast out their fear" by illustrating to his players that although the field house was much larger than their hometown gymnasium, everything about playing basketball was the same. Rev. Daniel Motto spoke of this moment at Wood's funeral in October of 1999, saying that when he saw this scene in the movie Hoosiers, it was then that he realized the film was truly inspired by Wood. Were the final game scenes in the movie shot at the actual field house? Yes. The scenes for the final game in the movie were shot at Butler University's Hinkle Field House, which was where the real life events behind the Hoosiers true story unfolded. The filmmakers could not find enough extras to fill the field house. Therefore, in order to give the large arena the appearance it was full, 1,000 extras had to be moved around the arena. Filling Hinkle Field House was not a problem for the actual 1954 game. The arena was filled to the rafters, and tickets were being scalped outside for as much as fifty dollars. Is the announcer at the final game in the movie the real 1954 announcer? Yes. The announcer at the championship game in the movie, Hillard Gates, is the real life announcer who did the 1954 championship game. 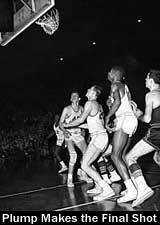 Did the team really win the championship in 1952, coming out of nowhere? No. 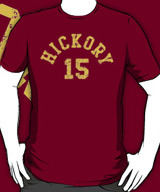 In the movie Hoosiers, the Hickory Huskers emerge from nowhere to win the title. In real life, the Milan Indians won the title in 1954 not 1952, with a 19-2 regular season record. The Indians had made it to the semi-finals of the state tournament the year before, after the 1952-53 regular season. They were however, often considered underdogs because of their small school size of 161 students. Was the championship game won 42-40 against the South Bend Central Bears? No. The real championship game was won 32-30 against the Muncie Central Bearcats. Like South Bend from the movie, the Muncie Central Bearcats were a powerhouse team from a much bigger school. How much of the championship game played in the movie is accurate? Not much. In real life, Coach Wood ordered a stall twice during the final quarter. Milan's star player, Bobby Plump, literally held on to the ball, without moving, for 4 minutes, 13 seconds, before taking a shot (and missing) with a few minutes still left on the clock. On Milan's next possession, Plump again stood stationary with the ball as the clock ticked down from 1:18 to 0:18. 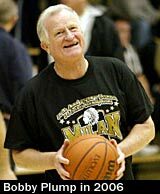 In 1987, Milan star Bobby Plump told the Saturday Evening Post, "The final 18 seconds were the only thing factual in the movie about the Milan-Central game. From the time the ball was in bounds after the final timeout, the movie was accurate." This includes Plumps thrilling game-winning shot. Did the star player really convince the Coach that he should take the final shot? No. During the final timeout, with the score tied near the end of the movie, Hickory's star player, Jimmy Chitwood (Maris Valainis), is told by the Coach that he'll be a decoy while the team runs its "picket fence" play, where a fellow teammate will take the last shot. The teammate, who is uncertain of himself, looks to Jimmy, prompting Jimmy to say with confidence to his Coach, "I'll make it." In reality, Coach Wood told Bobby Plump to take the final shot all along. "I was a very shy kid," Bobby Plump told the Washington Post in 1995. "I never would have said, 'I'll make it.' " Pictured at left is a photo of Plump's famous shot going through the basket at Hinkle Field House. What is a Hoosier exactly? Hoosiers is the nickname of Indiana University athletic teams. Webster's dictionary defines the word Hoosier as "a native or inhabitant of Indiana". In 1919, historian J.P. Dunn revealed that the word Hoosier came from the Cumberland dialectical term hoozer, which means something large or big, literally a big hill. This origin is referenced in Webster's, but it is believed by some to be false, since Hoozer did not appear in a Cumberland dialect word list until 1899. This is well after the first recorded usage of the word Hoosier in the US. In 1826, the word Hoosier appears in the June 2 edition of the Chicago Tribune: "The Indiana hoosiers that came out last fall is settled from 2 to 4 milds [sic] of us." This early usage suggests that the term may have been used to describe an uneducated, rural yokel, a rustic. The word was later adapted to mean someone from the state of Indiana. In Europe, the movie was renamed Best Shot, because most Europeans were unaware of the word Hoosier and its relation to Indiana and Indiana athletics. Who was the producers' original choice to play Coach Norman Dale? The original choice for Norman Dale was Jack Nicholson. He backed out due to a scheduling conflict, telling the producers that if they couldn't find another actor to play Dale, he would do it the following year. Robert Duvall also passed on playing Coach Dale. Gene Hackman then stepped in to take on the role. Did all of the actors on the team have high school basketball experience? Not quite. Surprisingly, actor Maris Valainis, who portrayed the movie's star player, Jimmy Chitwood, was the only actor on the Hickory team who hadn't played basketball in high school. Valainis was only 5-foot-6 as a teenager, and he got cut three straight years from his high school basketball team. For the scene where his character Jimmy shoots baskets while he listens to Coach Dale (Gene Hackman), Maris Valainis said that he "wasn't even listening to him. I was just concentrating on making them and I made one and they kept going in." Today, the Hoosiers actor is a golf pro at Rancho San Joaquin Golf Course in Irvine, California. He has a 1-handicap. What happened to the Coach after winning the championship? Marvin Wood continued to coach basketball until 1999, the year of his death. At the time of his resignation, the 70-year-old Wood had been busy coaching his granddaughter's seventh-grade basketball team. He stopped after he learned that bone cancer, which had been in remission for more than seven years, had returned. Wood is survived by his wife Mary Lou, their daughter, Deidra, and three grandchildren. He was elected to the Indiana Basketball Hall of Fame in 1971. What became of Milan star Bobby Plump? After high school, Milan star Bobby Plump (Jimmy Chitwood in the movie) played basketball for Butler University where he became a 4-year letter-winner, MVP his junior and senior years, and one of the NCAA's best free throw shooters of all-time. After graduating from college, he played three years for Phillips 66 of the National Industrial Basketball League. Plump eventually took on a career operating a life insurance and financial consulting business for nearly forty years. He opened a restaurant called Plump's Last Shot, located in the Broad Ripple area of Indianapolis. It is filled with memorabilia from the 1954 state championship team. His book, Last of the Small Town Heroes, was published in 1997. It is available on the right. Did any members of the original team have cameos in the movie Hoosiers? Yes. 1954 Milan Indian Guard, Ray Craft, has two cameos in the movie. He is the person who greets the Hickory Huskers when they arrive at the state finals. He is also the person who tells Coach Dale (Gene Hackman) before the state final, that it is time for his team to take the court. In real life, Ray grew up to become the assistant commissioner of the Indiana High School Athletic Association. Why was there so much fiction injected into the movie Hoosiers? Hoosiers screenwriter Angelo Pizzo summed up the film's heavy dose of fictionalization by saying that the added drama was necessary, "because their lives were not dramatic enough... The guys were too nice, the team had no real conflict." Angelo Pizzo is a Bloomington, Indiana native and the college roommate of fellow Indianian and Hoosiers director David Anspaugh. The two had often talked about making a movie "about the meaning of basketball to people in Indiana." The photo below opens in a separate window. The following text identifies the individuals in the team photo. Front row, from left: team manager Oliver Jones; cheerleaders Marjorie Ent, Virginia Voss, and Patty Bohlke; and team manager Fred Busching. Middle row: Assistant Coach Clarence Kelly, Roger Schroder, Bill Jordan, Gene White, Bobby Plump, Ken Delap, Ray Craft, Coach Marvin Wood. Top row: Principal Cale Hudson, Assistant Coach Marc Combs, Ken Wendlman, Bob Wichman, Ronnie Truitt, Glenn Butte, Rollin Cutter, Bob Engle, Superintendent Willard Green.